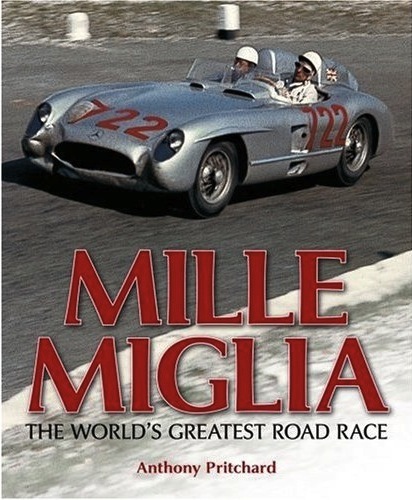 Of the several road races in Italy it is the Mille Miglia, a 1000-mile open-road endurance race that made, as Pritchard writes, “champions of men and heroes of champions.” Two unrelated fatal crashes occurred during the 1957 Mille. 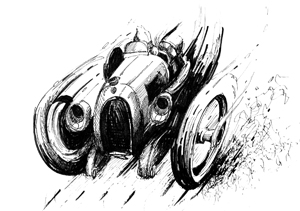 One of them killed not only the driver/s but the race itself when Spanish millionaire driver and nobleman Alfonso de Portago blew a tire on his Ferrari at 150 mph and careened from one side of the road to the other killing five spectators on each. Game over. 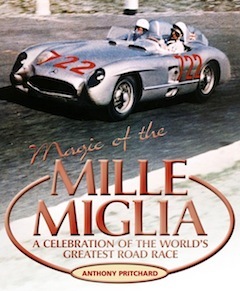 This book was written to coincide with the 50th anniversary of the last running of the original Mille. (It still exists today, with a different name and profile). But it is pointless, and not at all the purpose of this book, to frame the Mille in terms of casualties. Considering that 5300 participants and 100 million spectators attended the 24 runnings since its inception in 1927, the death toll of 56 in all those years is a rather small number. The casualties at the 1903 Paris–Madrid race probably had far greater psychological impact, but even they did not put an end to road racing. In a way, that last Mille was only the proverbial last straw in a decade full of exceptionally dramatic racing fatalities that finally made fundamental changes to the sport inevitable. Four Italians, inspired by the 24 Hours of Le Mans, first hatched the plan to wring out their sports cars on the country roads between Brescia and Rome and back. The cars had to be stock production models; big or small, fast or slow, anyone could run anything. You can see how this leads to logistical complications, and they make up a good deal of the drama of this event. 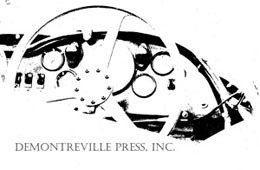 Add to that ordinary public roads, through hill and dale and blind corners and the occasional livestock, local paisano, or even trucks and busses on the road while the race was underway and you know what Pritchard means when he speaks of the Mille’s “flamboyant spirit” he wants to capture in this book. And he does, in the form of many quotes and anecdotes, but if that were all, the book would not be a proper Pritchard. 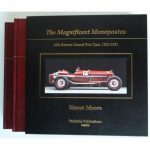 His various and many books are staples in every serious motoring readers’ library because of the thoroughness of his work and the wide range of his motorsports knowledge. He also has a recognizable conversational style that makes his fact-laden prose painless and enjoyable to read. 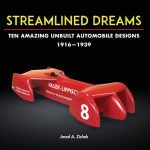 The purpose of this book is to give an overall view of the event, not to account for the helmet size of every driver or even construction specs of particular cars. It is therefore divided into broad categories—basic intro (founders, classes, starting order etc. ), Great Drivers, Great Marques, The Races to name a few. Drivers (8), and marques (10) are presented in alphabetical order in the form of personal bios and company histories respectively and deal with only the expected “big” names. Covered chronologically, each race starts with basic specs (starters, distance, weather, main contenders) and—very thoughtful!—refers to a page number at the back of the book that shows the corresponding road map. This is followed by a race summary in fairly fluid prose, not an easy feat considering the plethora of names, times, locations etc. that need to be dispensed. All these sections are augmented with sidebars offering more in-depth excursions into related matters. Multi-page interviews with Mille drivers Giannino Marzotto and Hans Hermann bring the narrative proper to an end, followed by several pages of maps showing route changes over the years. A final chapter revisits the wider context of the 1957 accident once more, using three lengthy excerpts from UK and US motoring magazines that focus especially on de Portago’s personality and crash specifics. A decent Bibliography and thorough Index are a given in a Pritchard book and don’t disappoint. Nor do the photos (properly captioned and credited), also always a reliable hallmark of his books. It should not be overlooked that some are in color, definitely a novelty for the time. Assuming it is understood what direction Pritchard wanted to go with this book it is difficult to think how anyone could find it unsatisfactory. The novice will want it to get a thorough grounding in the allure of the Mille and the specialist will want it to get their head out of all the micro detail and see the big picture. 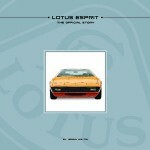 The US version has a different title and cover.